The following is the Boxing Insider notebook for the week of May 23rd to May 30th, covering the comings and goings in the sport of boxing that you might have missed. A matchup between exciting former world champions Omar “Panterita” Figueroa (26-0-1, 18 KOs) and Robert “The Ghost” Guerrero (33-5-1, 18 KOs) headlines an action-packed night of Premier Boxing Champions on FOX and FOX Deportes on Saturday, July 15 in the first boxing event at the newly-renovated NYCB LIVE, home of the Nassau Veterans Memorial Coliseum. Televised coverage begins at 8 p.m. ET/5 p.m. PT from the first boxing event at the Coliseum since Mike Tyson headlined in 1986. Also televised in prime time, Artur Szpilka (20-2, 15 KOs)meets Adam Kownacki (15-0, 12 KOs) in an all-Polish heavyweight showdown that promises fireworks. The undercard has been announced for promoter Dmitriy Salita blockbuster “Detroit Brawl” on Friday, June 16, 2017, at the Masonic Temple in Detroit and it features an impressive mix of local and international prospects in high-stakes match-ups. 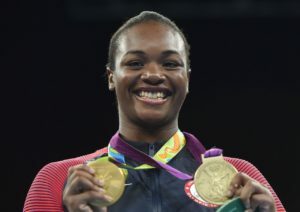 Thus far, five exciting bouts are scheduled in support of the eight-round main event featuring two-time Olympic Gold Medalist Claressa “T-Rex” Shields (2-0, 1 KO) of Flint, Michigan, taking on Mery Rancier (7-8-3, 5 KOs) of Santo Domingo, Dominican Republic, for the WBC Silver Super Middleweight Championship and the 10-round co-main event between undefeated Detroit cruiserweight Demetrius Banks (9-0, 4 KOs) and Detroit via Russia’s Alexey Zubov (14-1, 9 KOs). Tickets for “Detroit Brawl” are priced at VIP $200, Box Seats $100, Floor Seating $100 & $55, and balcony seating $40, and are available at all Ticketmaster outlets and Ticketmaster.com. More fights, opponents and rounds will be announced shortly. On fight night, doors open at 7:00 pm and the fights begin at 8:00 pm. New England’s top prospect with 10 pro fights of less, undefeated hometown favorite Irvin Gonzalez, is on a fast track going into his June 10th headline fight in the third installment of the “New England’s Future” series, at the DCU Center (Exhibition Hall) in Worcester, Massachusetts. Undefeated NABF Super Bantamweight Champion and Coachella native Randy “El Matador” Caballero (24-0, 14 KOs) will make his first title defense close to home as he takes on Los Angeles’ Oscar “Jaguar” Negrete (16-0, 6 KOs) at Fantasy Springs Resort Casino in a 10-round main event for the June 30th edition of Golden Boy Boxing on ESPN. This marks the 50th show that Golden Boy Promotions has put on at Fantasy Springs. Former IBF and WBO Featherweight Champion, Mexican actor and circus performer Jorge “El Maromero” Paez (79-14-5, 51 KOs) will be the VIP guest for this June 30th Golden Boy Boxing on ESPN card. Best known for a fight career spanning nearly 20 years and three weight divisions, Paez faced many of the boxing greats in the 1990’s including Oscar De La Hoya, Genaro Hernandez, Rafael Ruelas and Jesus Chavez. As the VIP guest of the night, Paez will be in attendance for the fights and will be on hand to meet fans; sign autographs and take pictures inside the Fantasy Springs Special Events Center before the ESPN broadcast begins. The meet-and-greet is open to the public with the purchase of a ticket to the event. Caballero, a former IBF Bantamweight World Champion, looked impressive coming back after a long layoff on the inaugural edition of Golden Boy Boxing on ESPN in March, taking a unanimous decision off of a game and rugged Jesus Ruiz. Now, Caballero takes on an undefeated fighter for only the second time in his career. Negrete has built a solid resume culminating with a shutout, unanimous decision over Victor Ruiz on Cinco de Mayo weekend in Las Vegas. In the co-main event, standout amateur and WBC Youth Super Featherweight Champion Lamont Roach, Jr. (13-0, 5 KOs) of Washington, D.C. will defend his title for the first time against a soon-to-be-named opponent in a 10-round scrap. Hoping to make TV time, heavy-handed Genaro “El Conde” Gamez (4-0, 3 KOs) from San Diego, California, returns to Fantasy Springs for the first time since knocking an opponent clear out of the ring last September. This time, he will take on Miguel Barajas (2-2, 1 KO) from Guadalajara, Mexico in a six-round match-up of super featherweights. On the non-televised portion of the card, lightweight contender Ryan “Blue Chip” Martin (18-0, 11 KOs) of Chattanooga, Tennessee will bring his unblemished record to the desert in an eight-round fight against a soon-to-be-named opponent. Welterweight KeAndre “The Truth” Gibson (16-1-1, 7 KOs) will look to come back from the first loss of his career when he takes on Dennis “The Spartan” Dauti (14-2, 7 KOs) of Naousa, Greece in an eight-round affair. Hot off his professional debut, standout amateur Luis Feliciano (1-0) from Milwaukee, Wisconsin and fighting out of Rancho Cucamonga will be back in action for a six-round super lightweight showdown against Baltazar Ramirez (3-2, 3 KOs) of Ciudad Juarez, Mexico. And opening up the card, Philadelphia native Damon “No Smilin” Allen (11-0-1, 5 KOs) will put his undefeated record on the line in an eight-round match-up of lightweights against a soon-to-be-named opponent.